We can regain our city streets for people as the driverless car revolution takes hold. We’re at a watershed moment in the design of our cities, and it’s all being caused by a new technology: driverless cars. No other innovation will impact the urban landscape and the ways people experience cities as thoroughly in the coming years. And that future is coming sooner than you might think. Most experts agree that the automobile as we know it will be largely obsolete by 2030. In its place will be fleets of driverless cars that shuttle people safely and efficiently through our city streets. But it’s the broader impacts of this technology that are a game-changer for the future of our cities and the human experience. The opportunity is not only to create new places that accommodate driverless cars, but to reshape our existing cities and towns into the kind of amenity-rich, vibrant places that we all enjoy. To me, what’s so provocative is that the average private car in the US sits unused 95 percent of the time. Just think about the amount of space all those cars take up, and what an enormous opportunity we have to convert that space into a public amenity. The way I see it, driverless cars are the catalyst for taking our city streets back for people and creating memorable experiences that rival the great walkable cities of the world—places like Copenhagen, Paris, and Vancouver. The average car in the US is utilized 5% of the time. To understand the positive impact it will have on people’s lives, it’s helpful to know what the driverless car does. In broad terms, driverless cars will sense the environment and maneuver without human input. To navigate, these vehicles rely on a combination of GPS, INS, and pre-built maps. On-board technologies such as radar, infrared cameras, and lasers will detect obstacles, recognize traffic signals, and keep cars within their lanes and traveling at a safe distance from other vehicles. 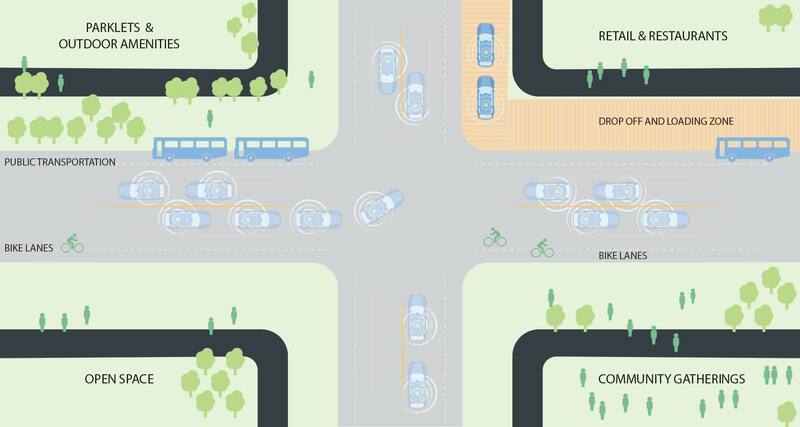 Using these technologies, driverless cars will be able to move more efficiently along our streets and operate in closer proximity to each other, increasing the capacity of travel lanes. They will also eliminate the risks introduced by drivers who are constantly merging and weaving through traffic. Accident prevention and obstacle detection systems located at the front and rear of the car will recognize curbs and assist in parking. Cameras will extend vision at night without blinding other drivers and recognize red lights, traffic signals, and construction zones. A series of lasers provide a 360º view to identify road markings, emitting pulses of light that map the immediate environment. The result of these advances is that people will gain back many hours in their lives for other pursuits. What would they do with that time? In one industry survey, the most popular responses were: work, read, FaceTime, watch a movie, eat, and sleep. In response, Gensler researchers have worked extensively to study possible layouts and amenities of a driverless car—with features like a fold-out bed, coffee bar, and work table. This opportunity to enrich people’s lives comes at a good time, because more people will be living in cities than at any time in human history—an astounding increase of 2.5 billion urban dwellers between now and 2050. With rapid urbanization, look for huge societal shifts in where and how people live, work, and play—largely driven by advances in technology and enabled by the way architects and designers reinvent our cities. In China, for example, our Shanghai Tower is an example of how major cities will grow vertically while offering more green space at ground level for pedestrian use. Or look at London, where cars have taken over the pedestrian-dominated city of the 19th century. Soon some of those streets could be closed to traffic and given back to people. That future is already here in New York, where Times Square has been taken away from cabs, cars, and buses and recreated as a people- and bike-friendly center of activity. 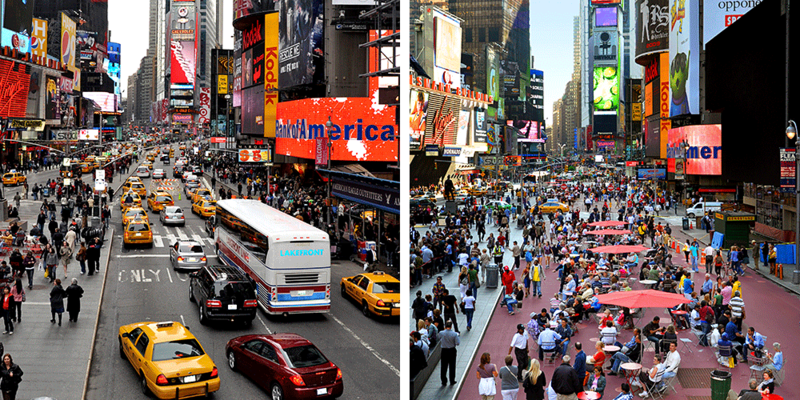 These views of New York City's Times Square (before and after) show the recently transformed, people-friendly zone that added 110,000 square feet of usable pedestrian space. Image © NYCDOT. Early adopters of driverless car technology will include large companies looking to reduce overhead with driverless commercial shipments. Budweiser has successfully completed a 120-mile shipment with a driverless tractor-trailer in Colorado, and retail giant Amazon is rumored to be working on self-driving delivery vehicles. This innovation will bring massive employment shifts, particularly among truck, bus, delivery, and taxi drivers—whose 6 million jobs will be displaced in the US alone! Truck, bus, delivery, and taxi drivers account for nearly 6 million jobs. Virtually all these jobs will be eliminated within 10-15 years. All these factors create an environment for disruption in how we drive, park, own, and insure cars—and it’s happening now. As this fast-developing technology reaches a tipping point, its impact will bring big changes to cities and urban real estate. Many researchers predict that driverless cars will attain widespread use between 2020 and 2025, according to Fast Company. As driverless cars reach the mainstream, they are likely to be more compact than today’s vehicles. Streets won’t need to be as wide and curbside parking will disappear. With this newly freed space, designers will look to create sidewalk cafés, parklets, extended bike lanes, larger drop-off locations, and pedestrian-focused spaces with wider sidewalks or places for the community to gather. Giving Streets Back To People — Roadways will be reclaimed for people in the form of pedestrian zones, bike lanes, community spaces, outdoor cafes, and parklets. Image © Gensler. At the same time, drop-offs and passenger loading zones will become the new entrances into buildings. Everyone will be dropped off at the front door—curbside service. We are already designing buildings with more drop-off space and more areas designed to provide better access to the buildings. Even the airport of the future will look radically different than it does now, without the large blocks of parking and much more space dedicated to passenger pickup and drop-off. This creates opportunities for more open landscaped surroundings and a better experience for people. Often, I get asked if driverless cars will threaten our public transportation systems. But I think it’s just the opposite: the ability to summon driverless cars will promote the use of public transportation by bridging the “first/last mile” between a person’s residence and the nearest transit stop. Cities are likely to create designated zones for driverless cars to occupy as they await riders, millions of whom already use on-demand ride-sourcing services today. And, as more people move to cities and fewer of them own cars, the combination of public transit and driverless cars will give us opportunities to design more vibrant, amenity-rich cities. More people will want to live close to walkable, mixed-use, transit-oriented developments when driverless cars are easily available to get them to their train or bus. The ripple effects of the driverless car will require architects and real estate professionals to completely reimagine how space gets allocated. The demand for parking will drop dramatically and its impact will be enormous. America’s parking footprint, estimated at 500 million parking spaces, consumes more land than Delaware and Rhode Island combined. Think about what we can accomplish by converting parking floors and garages to better uses, and eliminating parking in most new developments. Three above-ground levels of 84.51º Centre are used as parking today, but they have horizontal floors for future conversion to offices or other uses. Image © Garrett Rowland. Anticipating this change, we tasked a Gensler research team with studying how to optimize parking structures to allow for later conversion to other uses. Among their recommendations: install above-ground parking, pour flat-surfaced garages with higher ceilings, and enclose the space to make future heating and cooling easier. 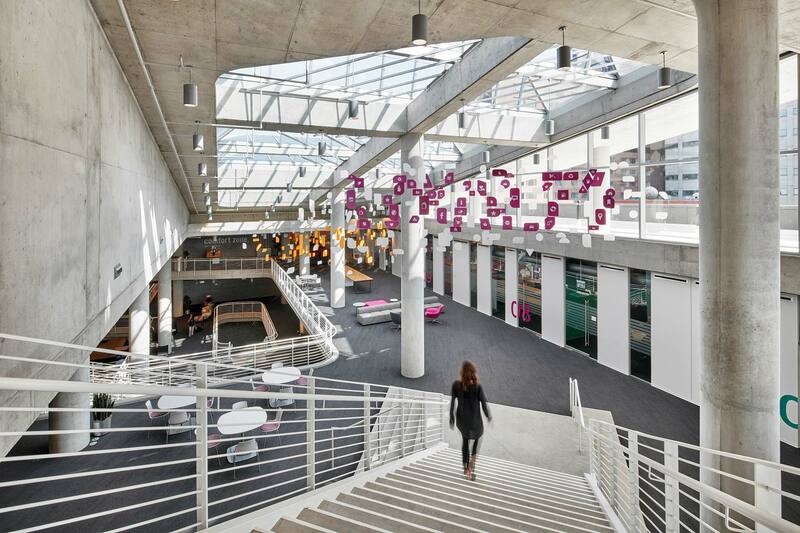 We’ve put this thinking into practice at 84.51° Centre, a mixed-use building in Cincinnati. It has three levels of above-ground parking that can be converted to office space when parking demand declines. Other buildings designed this way might also house workout facilities, apartments, or other uses in the future. Another practical use is as data centers, which will be in greater need to support the technology used in driverless cars. Well-positioned land currently occupied by gas stations or car dealerships will also become prime sites for redevelopment. This is happening today along the Expo Line in Los Angeles, where new transit infrastructure is quickly reshaping the city. Along that rail corridor, we’ve designed Martin Expo Town Center, where a complex of residences, offices, a landscaped plaza, and retail will incorporate a Cadillac dealership that once occupied the entire site. One of the major challenges facing adoption of the driverless car is zoning. Older zoning codes still require a high percentage of parking, so we need to show states, cities, and counties that a big change is on the horizon. Soon all that parking won’t be necessary. Cybersecurity is a new exposure when it comes to cars, and driverless cars are vulnerable to hackers. We’ll have to overcome that. In the auto insurance industry, the loss of $80 billion a year in revenue could lead the industry to oppose driverless technology. And safety questions are not all answered. For now, proponents acknowledge that further advancements are needed to solve for potholes, snow, reflections, construction obstacles, bicyclists, and pedestrians. STATISTICALLY, THE LEAST RELIABLE PART OF A CAR IS THE DRIVER. On the plus side, driverless cars get a boost from another statistic: human error causes 93 percent of car accidents. About 40,000 Americans die in car crashes every year, the equivalent of 96 fully loaded jumbo jets. If planes crashed this often, we’d all stop flying. But if cars are made fully and safely driverless, then 99.7 percent of road accident–related injuries would be eliminated, according to sources cited by the Financial Times. There are environmental benefits too. Today our gas-fueled vehicles are a major cause of global warming. But the industry predicts driverless cars will result in huge reductions of CO2 emissions that could be a game-changer in making the planet healthier. It’s estimated that, by 2030, the driverless electric car will release up to 94 percent fewer emissions per mile than a conventional car today. The shift to driverless cars over the next 15 to 20 years will be mind boggling, removing 6.8 million cars from the road in New York, Los Angeles, and Dallas alone. In New York, it’s projected that 60 percent of current commuting miles will be replaced with ridesharing and ride-sourcing services and driverless cars. In Los Angeles, where car-centric planning has dominated for decades, 44 percent of current commuting miles will be replaced in the same way. This change happens at a time when many cities are moving toward offering a rich, dense, and accessible mix of uses that are impeded by the presence of cars as road-hogging traffic and bulky objects to be parked. By making driverless cars an integral part of urban movement systems that emphasize transit, bikes, and walking, cities will break their car dependence and embrace livability. It’s already underway. Cities and city-builders need to get ready for it. based in our Los Angeles office.